This week's harvest moon got us thinking about what it must have been like for farmers in early Canada. We were in luck! Archbishop Lynch saved an 1869 copy of The Canada Farmer, which was published in Toronto from 1864 to 1876. We found this magazine so interesting that we thought we'd share some of our favourite parts with you. The April 15, 1869 issue contains advice about choosing crops ("Parsnips... is a less troublesome and more certain crop than carrots. "), entomology (When we think of insects... we are very apt to doom the whole race to indiscriminate slaughter, and wage a war of extermination upon insects of every order, class, and kind. But by doing so we commit a very great mistake, for we not only destroy the innocent with the guilty, but we slay also our best friends with our bitterest enemies. "), keeping livestock ("Mangers should be low, and stables well ventilated and well lighted. "), dairy farming ("Cows should not only be milked with perfect regularity as regards the hours of milking, but they should be milked to the last drops"), and much more of interest to all kinds of farmers. "As we were walking in the garden last summer, we came across one of these 'squatters' among the squash vines. He was seated near his hole in the wall, surveying the premises, and apparently enjoying the growth of the vegetables, like a philosopher. Have you ever noticed, gentle reader, the benevolent expression in the eye of a toad? If it were not for his uncouth dress we would call him a gentleman. His philosophical mien was catching, and we fell to speculating upon the value wrapped up in that carbuncled jacket. We asked the question, 'What is he good for? It is said the Creator has formed nothing in vain - nothing without a specific plan and design. Why was this toad made so disgusting, dirt-coloured, wide mouthed, pot-bellied and moping? There is nothing to inspire effection or terror.' Just at that moment a pestiferous squash bug was crawling upon a leaf. In a moment his eye flashed with intelligence, and quick as thought his long tongue reached the insect, and his capacious mouth closed with a snap not unlike a percussion cap." 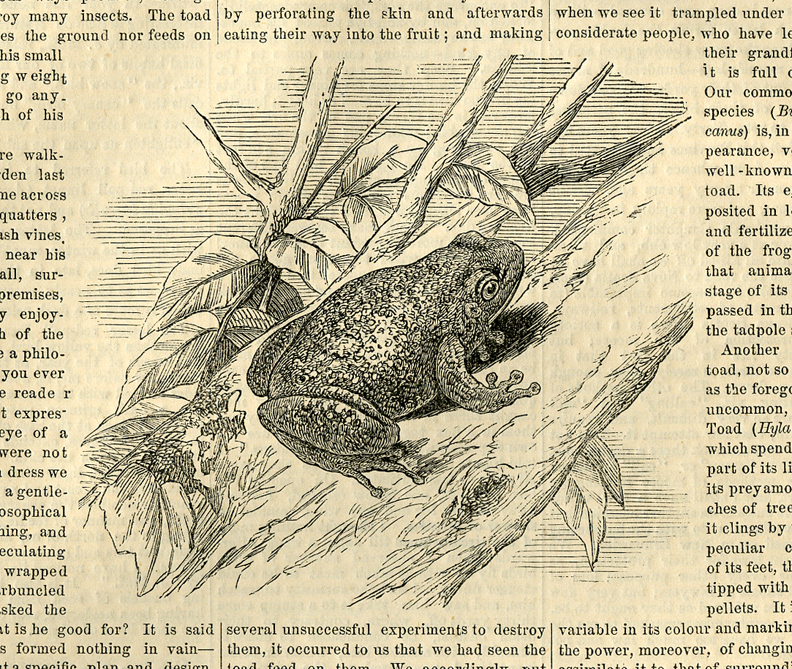 "The illustration represents the common tree Toad." "In proportion to what the toad is capable of doing, there is not a more useful animal to man. In the search of a livelihood his is sure to benefit somebody. He has no bad habits, yet how often do we find him the victim of an ignorant and cruel prejudice." "We cannot close this article without remarking that Mr. Arnold's raspberries are the result of careful hybridizing, that to such painstaking, careful cultivators we are indebted for many of our choicest fruits, and that there is yet room for further experiments with the hybridization of raspberries. The largest size and highest flavour of fruit, combined with the greatest productiveness and perfect hardihood of plant, are yet to be achieved." 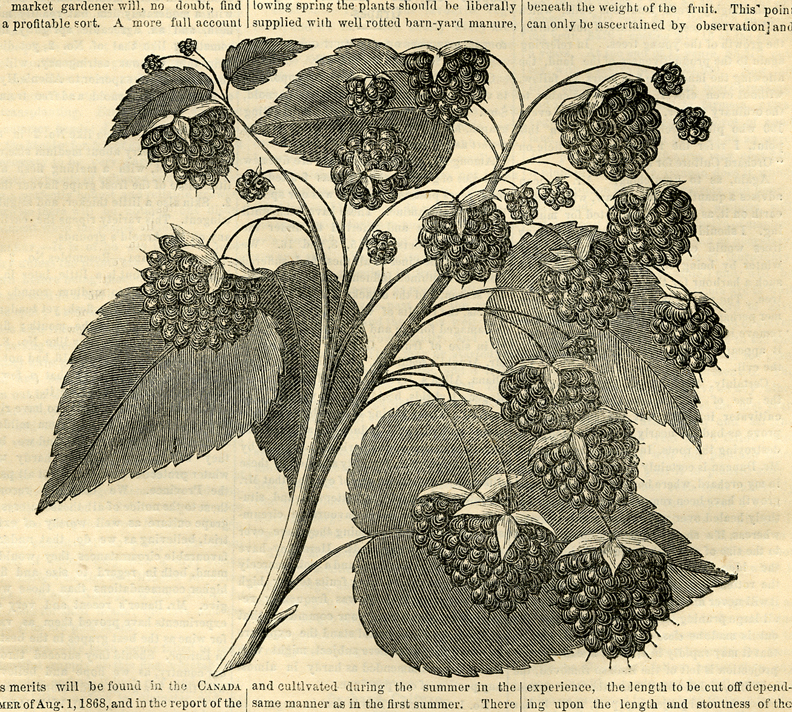 "We present our readers with an engraving of the Philadelphia Raspberry, a variety that promises to be a very valuable acquisition, especially because of its hardiness, a qualification which few good raspberries possess." "We have great pleasure in presenting to our readers the accompanying beautiful portrait of Mr. Stone's fine short-horn bull, "Grand Duke of Moreton," an animal that has gained the highest distinction in his class, and who, with his sire, Third Grand Duke (17,933), has contributed much to raise Mr. Stone's herd to its present eminent position. "...He is considered by many first-class judges to be the finest short-horn bull in America, and equal to any they ever saw, combining with an even outline, good constitution, colour, symmetry, docility, gait and size. He is, moreover, a first-class stock-getter, standing at present at the head of the Moreton Lodge herd of short-horns." Frederick Stone's Moreton Lodge was turned into the Ontario Agricultural College. Part of the building is still on campus at the University of Guelph. "Grand Duke of Moreton," the Property of F.W. Stone, Esq., Moreton Lodge, Guelph"
From an article entitled, "New Hand Seed Drill and Cultivator:"
"Mr. Fleming, of Toronto, in conjunction with Mr. Bruce, of Hamilton, has introduced a new implement, under the name of the "Dominion Hand Seed Drill and Cultivator," which promises to be a useful acquisition to the horticulturist. Its main purpose is that of a drill for small seeds, such as onions, beets, carrots, turnips, &c. It is simple in construction, and is said to do its work well, dropping the seed with regularity, covering and rolling the drill after sowing. The same implement, by a change very readily effected, namely, taking off the hopper and the roller, and substituting a cultivating attachment, can be used to perform the necessary operations of weeding and stirring the ground." 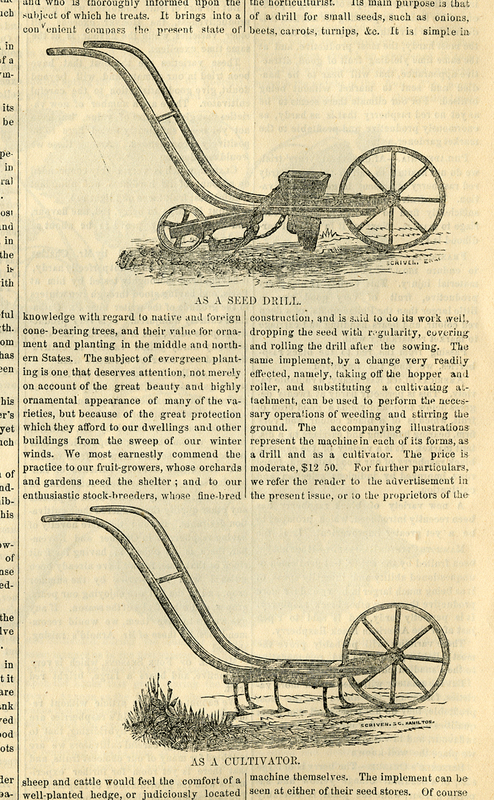 "Dominion Hand Seed Drill and Cultivator" "The accompanying illustrations represent the machine in each of its forms, as a drill and as a cultivator. The price is moderate, $12.50." 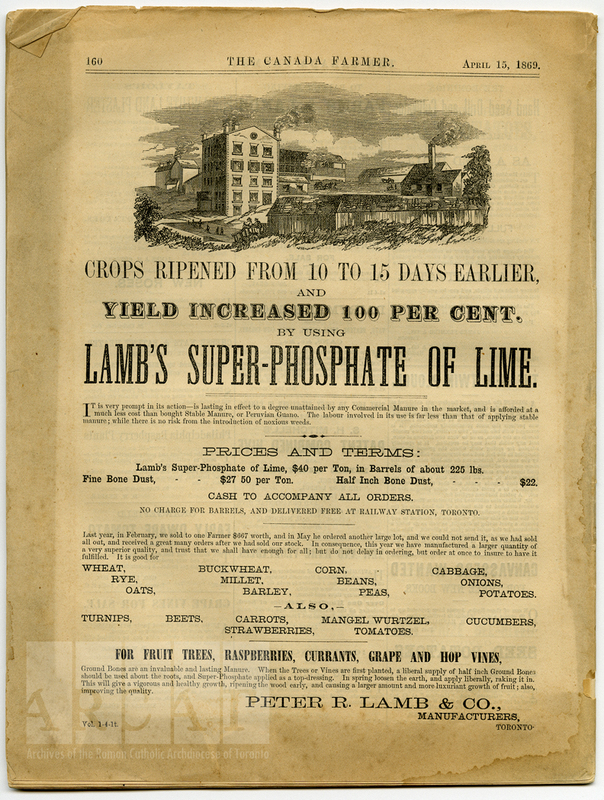 And the back page with an advertisement for Lamb's Super-Phosphate of Lime. Only $40 per ton! 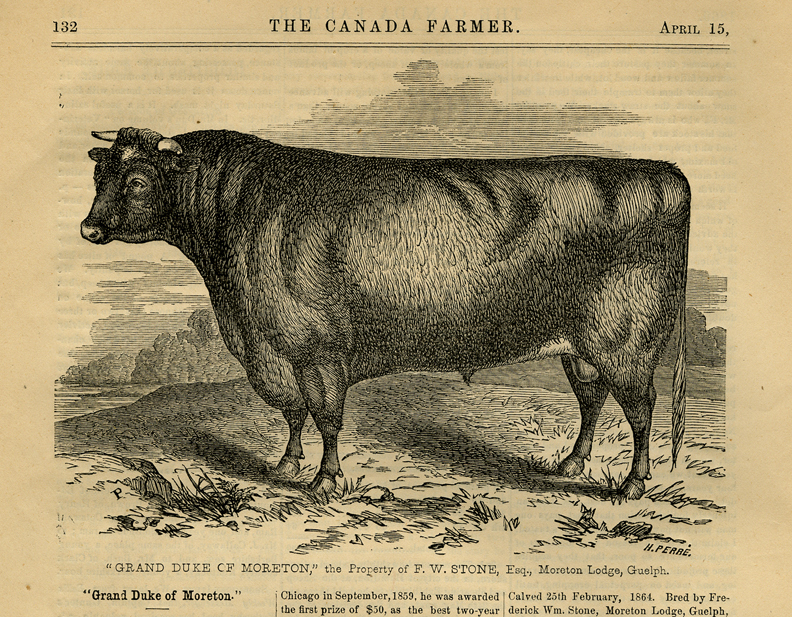 To read more of The Canada Farmer, check Early Canadiana Online. For more on the history of agriculture in Ontario, check out the wonderful online exhibit of the Archives of Ontario. "During the classical course of this venerable sexagenarian, which carries us back to about 1810 or 1812, they kept for several months, in the Seminary, a Beaver, which became as familiar with those who dwelt there, as dogs and cats ordinarily are in houses. One fine night in November, when the cold began to make itself felt, the animal, which they permitted to wander in full liberty through the dormitory, perceiving that, of all its fellow-lodgers, it was the only one which remained without protection from the cold, thought it prudent, no doubt, to consider about taking precautions against the still more rigorous nights wich were soon to come; and as it had no choice of materials for the construction of its hut, it seized upon everything which fell within its clutches. It accordingly made a tour of the beds, carrying off boots, trowsers, socks, cloaks, caps, etc., which it piled up in a corner of the hall, without a single one of the sleepers knowing anything of the clever theft. But lo ! the bell for rising sounds; and each of the scholars demands of his neighbour if he has not been playing him a trick in making away with the indispensable garment; but there was the same perplexity and the same questions on the part of the neighbours, when the Regent coming in, perceived master Beaver still very busy arranging the parts of his future habitation; turning over with his paw whatever boot persisted in sticking out to the derangement of its symmetry, or piling up with his tail any cap that would not stay in its place; drawing back, returning adjusting each portion, and resting from time to time on the top of the hillock, as though to contemplate with pride the amount of work accomplished in so short a time. Luckily for the robbed, the scene of the performance was in a third story; for no doubt if it had been on the ground floor, and the provident animal had been able to get out of doors, they would have found the novel hut built on the edge of the garden cistern itself, and it would have been much less pleasant to have had to draw the caps, boots, etc. out of the water."